This patient had had atopic dermatitis since birth and had always been on steroids. 6 years ago the condition got worse and she was told it could be from using steroids. Although she started a diet and treatment without steroids, the symptoms continued to come and go. One year after replacing all her dental fillings the dermatitis had gone and never recurred! As this patient had the condition from birth it is thought that it was initially contracted from her mother. Research shows that mercury freely passes the placental barrier and can affect the fetus. The fact that the patient's mother had palmoplanter pustulosis caused by mercury from her own dental fillings supports this reason. This patient was diagnosed with a metal allergy in her second year of junior high. The condition, which began on her fingers, was triggered by playing the flute. Steroid treatment was prescribed and the conditions seemed to settle down. However, it returned about 6 years ago and failed to respond to different treatments from various dermatologists. Eventually she was unable to continue working. Three months after we started replacing her fillings as well as stopping the steroids (photo, right), the dermatitis had completely gone. When this lady visited us the first time, her allergy was severe. By replacing her fillings and adjusting the alignment of her teeth, her condition dramatically improved. The photograph on the far right was taken 4 years after her last visit to our clinic. We hardly recognized her as she had changed so much. Condition has been improved after several months. 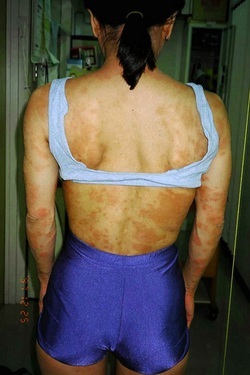 This patient's atopic dermatitis was particularly bad and she was undergoing steroid treatment from a dermatologist. As you can see, her posture was badly affected. This was because her malocclusion and jawbones couldn't support her whole body properly. Treating malocclusion and adjusting jawbones improved her posture as well as dermatitis. At dermatologist, they only looked at her skin condition without seeing her posture. That was why they couldn't verify the real cause. It's said there's no particular cause for this kind of severe and obstinacy skin condition. Patient eventually became not to be able to walk with the condition but it's not rare that conditions are improved with removing metal teeth fillings. The skin condition of the palms of one patient was so severe that it interfered with his job. After several months of dental treatment his condition completely cleared up.